1. Everyone realized how amazing our music sounded with Dave on the guitar. He took us to a whole new level. He also looked like he was enjoying himself and was so happy to be part of the team. He finally felt included, loved, and IN with God and his people. 2. A significant number of people on the worship team, in the congregation, and even on the staff had a problem with my decision to let Dave on the team because… DAVE SMOKED CIGARETTES! “We can’t have a smoker on the worship team.” Dave not only smoked cigarettes, he came to church with cigarette smoke in his clothes and would often smoke a cigarette out in the parking lot between the early and late service since he played in both. People would see him out there, then up on the “ministry platform” and wince at what they thought was Dave’s hypocrisy. Our lead pastor asked to talk with me about Dave, his involvement, and his cigarette smoking since he was getting most of the complaints. 1. I do not want to remove Dave from the worship team even though he smokes. He is serious about Jesus, and in time, I think he’ll deal with his smoking, but I think it’s good for him to be involved. He is a good guy, an addition to the team, and it will help him grow in his faith. 2. There are other people on the worship team who have deep sin problems that are just as evident (some struggle with gluttony, some have marital difficulty, some have been divorced, some have confessed long-term struggles with sexual issues). I was not comfortable removing any of them from the worship team since I knew that all of them wanted to move away from their sin — toward Jesus, and grow. The exact same thing was true for Dave, but his “sin” had a smell that stayed in his clothes, and chemicals that were in his body which would take a lot of work to remove. It would take time. 3. Unless everyone on the team would be willing to confess their “hidden” sins and step down from the team, I was not comfortable removing Dave for his “obvious sins” because he was walking in step-by-step repentance and would continue to grow. 4. I would tell Dave that on Sundays, in order to protect him from the immature conclusions of others, He should not smoke before or during Church, and he should wear clothes that did not smell like smoke. Otherwise, I had no other requirements for Dave. This was acceptable to our Pastor, and Dave continued to serve. To my knowlege, he continues to serve the Lord to this day. This is a pastoral example of processing an ethical question using a “Centered-Set” approach. Here’s that approach compared to two others. A “Fuzzy Set” approach to this would have said something like, “Don’t judge Dave. Who are we to say it’s wrong for him to smoke cigarettes? Where is the verse in the Bible about smoking? Leave him alone. A “Bounded Set” approach would have said something like, “Here it is in black and white on the worship team credo: No worship team member is allowed to smoke cigarettes. If you smoke cigarettes, you cannot be on the team” – thus, we would make the “boundary” or a boundary for serving based on whether or not a person smokes cigarettes, and we would not take into account any other factors. The “bound(ary)” is smoking. Smoking = OUT of the bound. Not Smoking = possibility of being INSIDE of the bound. A Centered Set approach (what I tried to use before I understood it) was – “Is everyone on the worship team growing in their relationship with Jesus (the center) — are they teachable, moving TOWARD Jesus and AWAY from destructive practices in a process? If they are, then they are modeling what it means to follow Jesus even if they are right in the middle of difficulties. Are they centered on Jesus, even if they still have struggles, and do they want to be free? 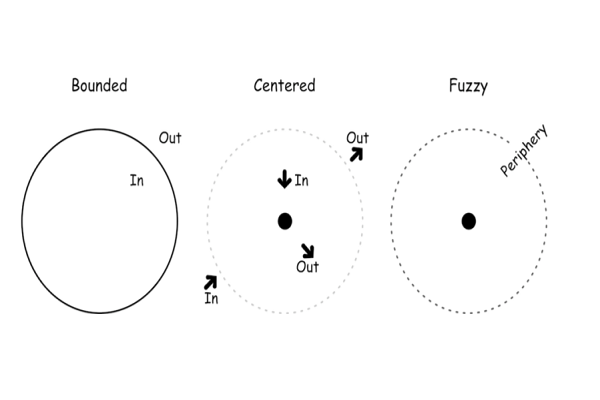 My approach (which I think was closest to a centered set, though some might feel it was fuzzy) was acceptable to our pastor, but I fear that in many churches, the bounded set is the way things usually go, and in many other churches, I see things moving toward fuzzy sets. I found this approach to ethics very helpful in pastoral work where religious ideals tend to drive discussions about (and responses to) ethical issues. Ok, this works for praxis (Edwards might have called me “antinomian,” but I think that there are a few absolutely forbidden practices, even fewer commandments, and the basic principle is “follow the Spirit where he leads” [Rom 8]). But what about doxa? What does a “centered” set look like doctrinally? There should be even fewer absolutes with regard to doctrine imo. We should keep it as minimal as “Jesus is Lord” and leave it at that. Understanding that none of us has much of an idea (if at all) what that statement means when we first say it. We spend our whole lives finding out what it means for Jesus to be Lord – both practically and doctrinally. Church should be the place where we can transparently wrestle with that, not pretend we’ve got it figured out. I like the Centered Set approach you’ve chosen as opposed to legalism or cheap grace. The diagrams are helpful. Some people focus on external behavior, majoring in rule-making and, eventually, hypocrisy. Others seem to believe that anything goes as long as we say we are followers of Jesus, mention His name from time to time, and proclaim that we love everybody. God knows I don’t have it all figured out, but my observation is that the Church today is trending more toward “anything goes” than toward oppressive, judgmental rule-making. I think we are becoming less and less in a position to oppress or control anyone as our power is diminishing in the culture. This is good for us in some ways. As Christians we had better learn to be humble. But if I say Jesus is my Lord I cannot then disregard His clear instructions in the Bible. Submitting to God and, what follows from that, submitting to His directives, is the truest humility of all. There are many gray areas but a Christian cannot pretend that everything is relative. As Samuel Johnson wrote, “The existence of twilight does not obscure the difference between day and night.” There are those who seem to claim that everything is twilight and this is just not so. Michael – I admit that I am not as minimalist as you’re willing to be with respect to doctrine. I can find quite a few doctrinal imperatives in the N.T. in addition to the proclamation that Jesus is Lord (and all that implies). BTW, I agree with you that it takes a LONG time to think about what “Jesus is Lord” means if we see it as the primary lens through which we view discipleship. It’s a good thing you’re not as minimalist as some other Vineyard pastors, Kenny. I decided to have a look at Michael’s blog. (Of course he has one – doesn’t everyone?) This is a bright guy, a college professor as well as a pastor, but where has his wrestling with the concept that “Jesus is Lord” taken him? November 7, 2013: “And now, some Christians in our culture feel compelled by troublemaker Jesus to stand in love and solidarity with homosexuals, to give them the support this healed man’s parents couldn’t bring themselves to give him. In all these cases, the rules seem clear. Keep the Sabbath. Tongues have ceased. The races shouldn’t mix. Women must be silent in the church. Homosexuality is a sin. We sure like our rules. And Jesus likes breaking them. Because Jesus is a troublemaker.” Okay, then. A link on Mike’s blog took me next to David Hayward: Master of Theology, Diploma in Ministry, over 30 years professional pastoral experience – 14 of them in Vineyard churches. He quit working in the Vineyard (lame pun intended) in 2010 and now critiques religion on his blog, “nakedpastor” via his cartoons and writings, but he still “shepherds” online at “The Lasting Supper”. I had no intention of conducting a witch-hunt in the vineyard (I’m not a heresy-hunting fundamentalist) but a couple of mouseclicks led me straight to two “wizards” among the vinedressers, busy trying to persuade Christians to buy their minimalist wine. I realize that two wizards does not a coven make. God is still sovereign and Jesus is truly Lord, so I also do not intend to panic or be overly distressed about what is happening. But the times they are a-changin’ in the evangelical church. As the apocryphal, old Chinese curse puts it, we are in for some very interesting times. Kenny isn’t a Vineyard pastor but I happen to be one, so I think responding to your comment is important. While you state that it wasn’t your intention to conduct a witch-hunt, it seems you have. Could you actually respond with some sort of actual content? What exactly do you take issue with in regards to what you’ve quoted? Do you disagree that evangelicalism has had a tendency to come across as homophobic and to oppress people? If so, you run against some very stimulating and convincing research. Again, I’m just looking for a little bit of substance to your comment here because I honestly don’t really get what you are concerned about. And since I happen to know Michael, I’d like to go on record as saying that he’s more than just a “bright guy.” I know he deeply cares about Jesus, truth, the kingdom, people, etc. So rather than post some obscure under the table comments, could you actually provide some explanation? What are you concerned about? What do you disagree with? What would you suggest as an alternative? The only one of any of Kenny’s affiliations I recognized on this page was that he’s a member of the Society of Vineyard Scholars, which is an arm of the Vineyard movement. I now see from his bio he’s also a Foursquare pastor. I don’t see what difference that makes regarding what I wrote, or why you feel you need to answer on his behalf. That’s it? It seems to you that I have? I hope you put more effort into your theology. If you think an exact quotation of a complete paragraph, allowing it to speak for itself, is a witch-hunt you are confused about the meaning of the term. I only mentioned the word because I had run across the other more egregious ex-Vineyard guy, David Hayward, through Mike’s blog and I wanted to reassure Kenny I wasn’t picking on the Vineyard. I’m not. I don’t care what denomination you belong to. You want content beyond verbatim quotes? Mike chose to post those words on his blog for all to read. For him, “Homosexuality is a sin” is just a “rule” that Jesus has now broken. He talks of Christians standing with Jesus in “solidarity with homosexuals.” You see nothing awry here? That homosexuality is a sin is clearly taught in the New Testament. Just because it isn’t written in those exact four words doesn’t negate this. I’m sure you’re familiar with the NT passages regarding homosexuality, or do you see them as worthless “clobber verses” as some do? This is just one of many warnings in the New Testament regarding sin which are put there for our own good. There is much bad news there about our sin along with the good news about our redemption. Recall what you’ve read there and tell me you disagree. No further explanation is needed; this couldn’t be any plainer. A child could understand it, and the fact that you pretend that my comment is obscure is troubling. Seriously? You haven’t heard why some Christians are concerned about this? Yet apparently you’ve noticed the “homophobic” evangelicals who like to “oppress people”. The use of the term “homophobic” is in itself a slur unworthy of you. By using it you accuse other evangelicals of a neurotic fear of homosexuals, a kind of mental aberration. An exaggerated concern about homosexuality is not the biggest problem in the evangelical church today, although we collectively have many faults and sins. We are not phobic, but there is something approaching a mania which is sweeping our culture and the church. It’s the attempt to legitimize and condone homosexuality. It affects pastors as well as theologians and it’s succeeding, but that doesn’t make it right. It’s strange you haven’t noticed it. Here’s an article you might be able to relate to better than my comment, the point of which you said you didn’t get due to its obscurity. I’m sure that was mostly my fault. This post is from the Think Theology site so you already know the author. I hope he isn’t a “homophobe” by your definition since he thinks homosexual behavior is a sin, but he also seems to be an eminently reasonable man. Having read this well-thought out article I can’t think of anything I disagreed with in it. He must have spent a lot more time on it than I did my hastily written comment. He’s probably also a better writer, possibly smarter and definitely more tactful than I am. If you can’t understand it I’m sure you could talk to the author about it. He comes across in his writings as a nice guy. ”I don’t see what difference that makes regarding what I wrote, or why you feel you need to answer on his behalf. Well, considering that I started ThinkTheology.org and am a primary contributor, I have recently deemed it widely acceptable that I can post or respond to whatever I see fit. Thanks for asking though! I responded to your comments because I found them… well, not in keeping with the spirit of most conversations here. We’ve been fortunate to have few trolls show up, but as I noted above, our lack of a WordPress plugin doesn’t seem to always catch them. Actually, yes, I do. I could post verbatim quotes as well, but that doesn’t really explain specifically what you are taking issue with. And I was interested in some of your actual concerns because I think it would be good to flesh those out. For example, see how I am quoting you and then actually responding to you? In the same spirit as your hope that I put more effort into my theology, I return the hope because thus far, it’s not very helpful. Furthermore, I’m wondering if you are accurately representing what Raburn stated… it seems as if you actually could be reading a bit into those “verbatim” quotes you posted. I’m wondering if you missed the intention of his point. Could it have been worded better? Possibly… I certainly would have. But of course, you have me all figured out and I’m must one of the “liberals,” right? Wrong. I realize that it might be a bit “extreme” to expect someone to be aware of all that is published here, but being that I noticed you seem to be able to use the “search” function here in that you found Kenny’s excellent post regarding Jesus and homosexuality, I’m going to suggest you take a bit more time before you hit that “reply” button. You might end up looking a little silly trying to argue with someone who likely holds to the same position as you. Thank you for your opinion. You are so very encouraged to have one. I wonder if you might be aware of the idea of “nuance.” If not the concept of “nuance,” perhaps the idea of “both/and” thinking. Clearly your response to me indicates that you have me pegged as a big bad liberal, but for the sake of still correcting you, I both share concerns about how how not all Evangelicals are “homophobic” as well as concerns about how people who identify themselves or are identified by others are homophobic. Have you ever heard of Westboro Baptist? Have you read any actual research on the topic? If so, I would love to see what sources are shaping your opinions here because it looks like you may not have actually interacted with people on this topic before. Once again, thank you for sharing your opinion. I’m not sure why you felt led to state that an exaggerated concern for homosexuality is not the biggest problem of the evangelical church. I certainly did not say that, imply that, or even come close to believing that. But again, lots of assumptions on your part here about me, so I’ll just chock it up to that… I hope. Once again, thank you for your wonderful contribution to this conversation. You have been entertaining if nothing else. Well, I’ve never been called a wizard before, but I have to say, it doesn’t come across as much of a put down. I’d rather be a Gandalf, but I’d take a Dumbledore. Just not an Oz, that guy was all hat and no cattle. Seriously though, I want to draw an important distinction here. Way up above when I talked about keeping things minimal I was specifically referring to what doctrinal commitments a community requires for admission to said community. Doctrinal commitments and moral commitments are quite different (though in some ways related) things. I prefer to keep doctrinal requirements to a minimum, not because they aren’t important, but because I think they take a long time to understand. For my own part, I am in agreement with the Nicene Creed and in close agreement with the Barmen Declaration. I teach my church toward that end, but truths such as these are better discovered than pressed onto people (imo). Forcing someone to say they believe things they don’t understand is disingenuous and counterproductive, again in my pastoral opinion. The only way this even touches the homosexual issue (which seems like an odd thing to have brought up here) as far as I can see is to what extent our doctrine addresses human nature as such. What we find there isn’t much to go on in terms of our current debate, other than the all-important imago Dei doctrine which applies to all humans, regardless of their gender identity or any activity, even sinful activity. My point was that forming a community around the person of Jesus and a commitment to the idea of making him Lord is enough around which to construct a robust church. I stand by that point. But that does not address the moral commitments that any such community must organize itself around as well. And not addressing that aspect was entirely intentional on my part because I have found it impossible to be heard well on this issue in any online forum. As an ethicist, one of my primary concerns is not just the construction of my words to make a given point, but how those words are received. It is impossible to predict all unintended consequences, but it is incumbent on someone who is morally serious to refrain from participating in discussions that bring harm to others. No where on my blog will you find a statement of my understanding of the ethics regarding homosexuality and Christians or even any hint of what I think on the matter. Any quote you bring out to that end, as the one above, is completely taken out of context and misused contrary to my clear and intended purpose. All I will say here on this matter substantively, is that just as pastors and church leaders must decide what sort of doctrinal requirements to organize around, they must also decide what sort of moral requirements to organize around. They should do so seeking the direct guidance of the Holy Spirit through prayer, fasting, communal discernment, and reading Scripture together as the Spirit illuminates them. Whatever doctrinal and moral requirements they decide, they should organize around those and live their lives together accordingly. And they should not expect other communities to look exactly like theirs, even when the same process has been employed. Trolling? Right back at you with the *Sigh*… For a sensitive guy you’re a little quick with the insults. First of all they weren’t “verbatim”, they were verbatim. They were exactly the same words as were originally used. No need for the scare quotes. Secondly, let’s say for the sake of argument I’m not accurately representing what he stated about homosexuality. I’m not going to paste the whole thing here, but what did he mean by this then? Believing that homosexuality is a sin is being equated with racism and legalism. How could anyone miss “the intention of his point”? I await your alternate explanation. I didn’t consider you a liberal but perhaps you’ve noticed there are lots of evangelicals who are “evolving” on this issue. It was this question of yours, “Do you disagree that evangelicalism has had a tendency to come across as homophobic and to oppress people?” that bothered me. The opposition on this issue likes to call Christians “homophobic” ad nauseum. Don’t you ever get sick of hearing the word? Of course, but apart from pointing out whenever Fred Phelps’ name comes up that he was a hatemonger and not an evangelical Christian there’s not much more I can do. People will often believe what they want to. Numerous atheists have insisted to me that Hitler was a Christian and once one even claimed that Stalin was as well. It would be pointless to have any guilt over the false ideas others have. I had read the article when it was reposted on another site some months ago. I remembered it and came to your blog to see what else he had written. I figured you had probably read it. I’m glad to hear that. I hope you also realize this isn’t always going to be a walk in the park for us evangelicals no matter how much “nuance” we possess. As for me, believe it or not, I am currently working on being more “gracious and reasonable.” “If it is possible, as far as it depends on you, live at peace with everyone.” It’s not always possible but let’s try. I’ve read your review of Ken Wilson’s book except for part 3. Are you aware the link to this part isn’t working? It’s as if it doesn’t exist. Did you deep-six it? Has no one else ever asked you about this? Interesting comment for someone who calls himself an ethicist. It’s a large enough piece of writing to stand alone without more context. What did you really mean by it other than what it obviously says?